So you thought bamboo would be cool? It's great to look at, a really good privacy screen and the shoots can be used for DIY projects as like free trellis for your garden pees. No one told you at your local garden center that bamboo was invasive or that it can be expensive to remove. What was fun, exotic and interesting to grow has now become your biggest headache! A running bamboo plant can be fast spreading and most aggressive. You can plant it in one spot in your yard and all of a sudden it's showing up in all kinds of places where you don't want it to. The secret to getting rid of bamboo is controlling it and knowing it grows. Bamboo goes through two growth cycles each year. In the Spring, it puts all of its energy into new straight canes and only a little bit of energy into the roots. As the season progresses, more energy is then put into rooting. The thin roots spread out underground making a fortress of strong roots. Less energy is being sent up to the new canes because, the rooting system is trying to establish a colony of sorts. It's important to know that the roots of bamboo spread and grow by way of underground rhizomes or roots. These rhizomes will travel a many long distances and then form a node. At that node, they will either form a new cane, or make a new section of rhizome and continue to travel. This is how it is able to show up some distance away from the main plant. You can literally plant bamboo in your front yard and it will appear in your backyard or your neighbor's yard or the yard across the street. Most people think that bamboo spreads through seeds. Nope.. bamboo spreads aggressively through their rooting system. I noticed that even my local gophers and rabbits didn't even like the bamboo. They didn't even like the new, soft, and tender shoots. In the back of my mind.. I knew that I had a problem. From experience, getting rid of bamboo isn't a weekend project. There are several key strategies that you can use to get rid of it.There's hope in your bamboo eradicating future. Southern California Land Management absolutely hates bamboo. It spreads through river bottoms, hillsides and neighborhoods. The hot arid climate, particularly during October - January when the Santa Ana winds blow, dry the bamboo out and it can explode into fire through combustion or from static caused from an animal's hair rubbing against the plant. Many wild fire's are started by rabbits having static in their fur. It's just like when you were a kid and you rubbed your feet against a rug or carpet than touched your sister in the ear. The first think you need to do when combating bamboo is build a containment system. Just like a forest fire, you want to keep it contained so it doesn't continue to spread while you work on it. Here comes the part that you didn't want to hear. You'll then need to dig out as much of the bamboo and roots as you can by hand or by machine. The goal here is to weaken the mother plant. The more roots and leafy green growth you remove, the less energy can go into the plant to rebuild it and spread. I'm sad that I have to break your heat and tell you the bad news. You really do need to dig out all of the roots and cane; otherwise, the remnants can form new independent bamboo plants which will again spread like 'wild fires.' Bamboo can also seem like it's gone but, it's been taking its time to grow new roots and rebuild a networking system. Searching out roots and new cane shoots, digging and ripping them out of the ground is something you'll have to do several times. I guarantee the first time won't do the trick. Lastly, you may come to the end of your robe and just get so damn frustrated. You're mad at yourself or for whomever planted the bamboo and mad that the bamboo is winning the battle. Your last weapon against the bamboo rhizomes from spreading and to continue to spread for years to come is to use an herbicide. Your last defense may be any product that will kill grass. 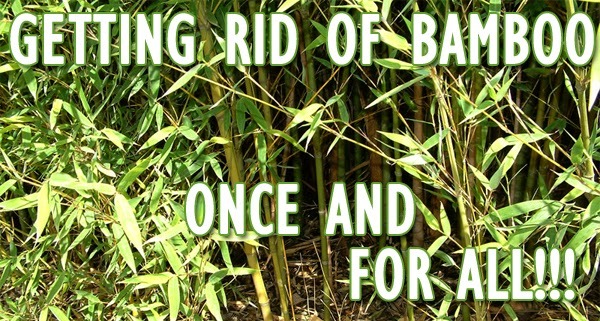 Any herbicide that kills grass will definitely kill bamboo. Chemicals of course aren't eco friendly but, products like Roundup or Killex are most effective at killing bamboo and guarantee that pets and other plants won't be effected if used properly. 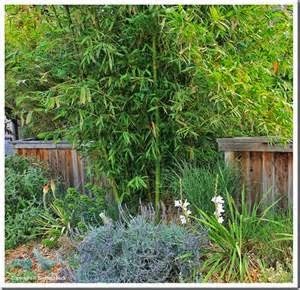 I thought bamboo was beautiful and would be a great way of creating a natural privacy without having to build a fence. It wasn't until the second year of having the bamboo when I noticed mine was appearing everywhere and heading for the neighbors yard. I dug and pulled the rhizomes out until I just couldn't take the back breaking work. I finally resorted to using Roundup. It worked. I felt guilty for using it. I had to lay a plastic cover over most of the dug up areas because, birds were wanting to look for fresh worms and bugs. After watering to dissolve the chemical I know have pretty border flowers and grass growing again. I plan on planting one or two bougainvillea there this fall. So, For two years I enjoyed the bamboo and for one year I lived in turmoil having to be a weekend warrior fighting to get my yard back from the forces of the almighty bamboo. Sometimes.. to win the battle you just have to give into the weapons of 'grass' destruction. I was satisfied using a chemical not only did I save my back and hands from wear and tear, I got my weekends back and the Roundup seemed to have dissipated without harm coming to any birds. A fresh sprinkling of grass seed filled the patches where we tore up the lawn just fine until my St. Augustine grass grew back.